Many County FA Women’s Cup finalists were confirmed on Sunday 18th February, from Somerset to Northumberland and from Kent to Liverpool. Luton Town accounted for AFC Dunstable with an own-goal and a Zara Carroll penalty, the Eastern League side then getting a consolation goal. Bedford beat Houghton Athletic 4-0 – with two goal for Olivia-Rose Cunningham – to join the Premier League Hatters in the Bedfordshire Cup final on 15th April. The Berks & Bucks Senior Cup final will be an all FAWPL affair, following narrow wins for Maidenhead United and MK Dons. 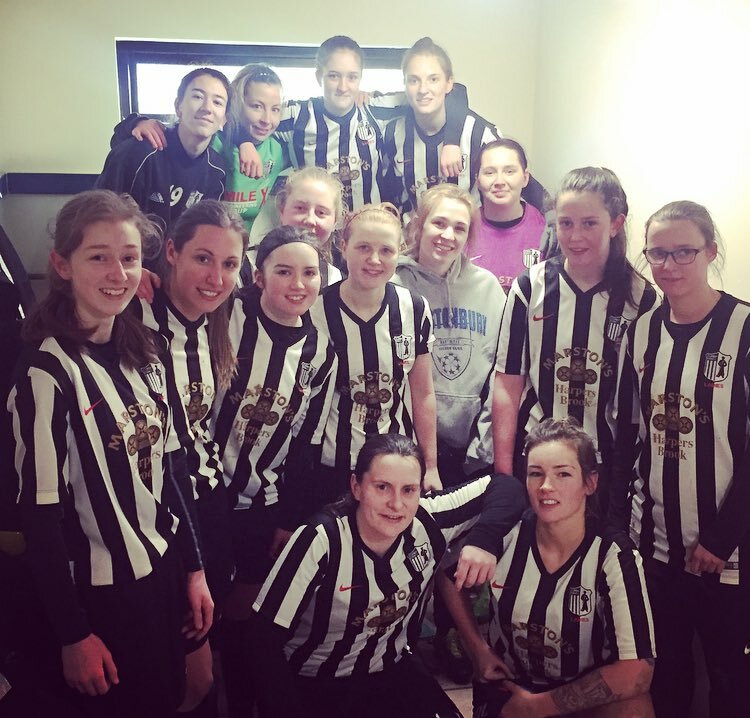 The Magpies needed a late goal by Tina Brett to defeat Woodley United, after Rosie Page-Smith had equalised for the visitors from two divisions below. The Dons also came through 2-1, away to Southern League leaders Chesham United. They were behind to a Gemma Darvill opener but Kerry Newman and Sasha Newsome turned the game round. 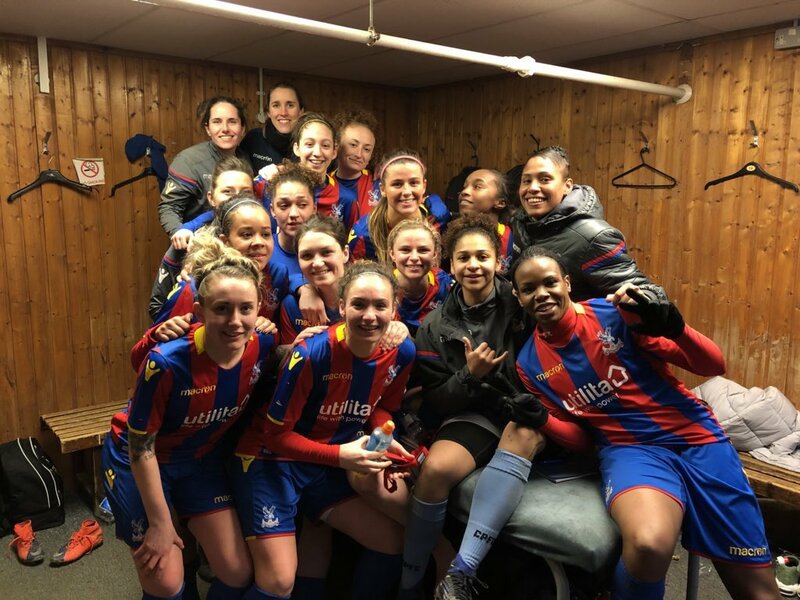 Crystal Palace won through to the Capital Senior Cup final with a 2-0 victory at QPR, Ciara Sherwood scoring first and Lilli Maple doubling the advantage in the last 20 minutes. The Eagles will meet Charlton Athletic or Leyton Orient on 18th April, with the Addicks and O’s playing this Sunday. In Derbyshire, Woodlands went through 2-1 at Long Eaton United Reserves and Derby County DS defeated hosts Chesterfield 4-0, Amber-Leigh Denny with a double. The final is set for 22nd April. 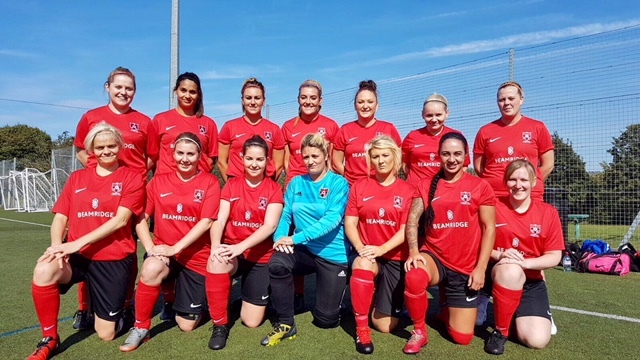 Chester le Street Town sank Consett 7-0 to reach the Durham final and are joined by Norton & Stockton Ancients, who beat Tyneside 3-1 with goals from Vicki Burton, Nyci Thorns and Courtney Corrie. The Essex Senior semis had very mixed results, with one tie going to penalties and the other a convincing margin of victory. Brentwood Town edged out Writtle in a shoot-out after a 2-2 tie with two spot-kicks saves from Kelly Walker, while C&K Basildon’s 9-0 score-line over Little Thurrock Dynamos included four from Jay Blackie. Hutton hit Rayleigh Town 6-1 to make the final of the Essex Trophy with Hayley Critchell bagging a brace. Megan Jiggins got both goals as Silver End were 2-1 winners over Frontiers. There were two clear away wins in the Hampshire Senior Cup, with Portsmouth scoring three times in the second half at Southampton Saints where Shannon Albuery scored the first and made the second, while Southampton WFC were 4-0 winners at County League leaders Southampton FC Women with Emma Pinner twice on target The final will take place on Wednesday 28th March at Havant & Waterlooville FC. Basingstoke Town Reserves eliminated Sholing 5-2 in the Hampshire Intermediate Cup with a strong second-half showing. 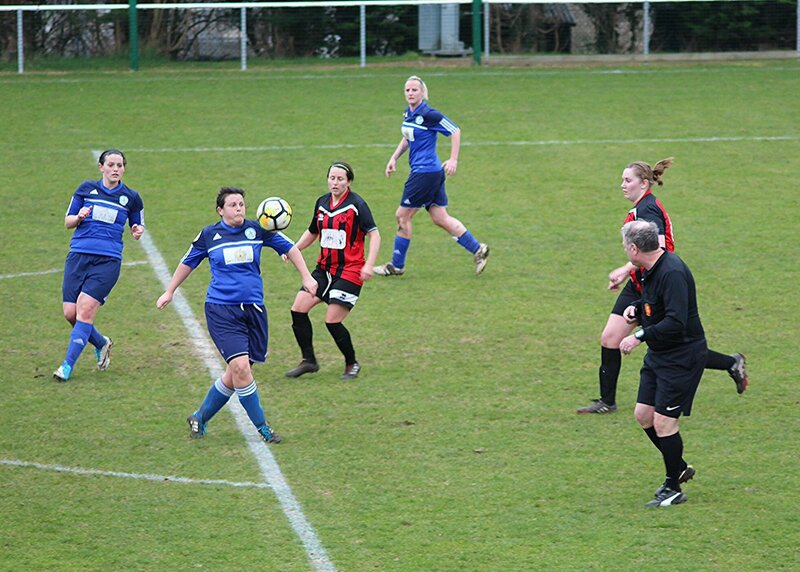 Jessica Dry scored three times and Billie Gardner twice to set up a showdown with Stoneham Town or Rushmoor, who try again to play their tie on Sunday. Thamesview beat Cray Valley 4-1 with three second-half goals to progress to the Kent Plate final. Bromley joined them with a 2-0 victory over Glebe, Nicha Dyett and Danielle Glancy scoring for the Greater London Division 1’s basement side. Holly Newman claimed a hat-trick as Nettleham beat Boston United 6-0 and they will take on Cleethorpes Town or Grimsby Borough for the Lincolnshire Cup. The second of the Liverpool Senior Challenge Cup semis saw Crosby go through 2-1 at Maghull. Their final opponents on 29th April will be Southport Athletic, who had previously won 3-2 at Pilkington Blues. 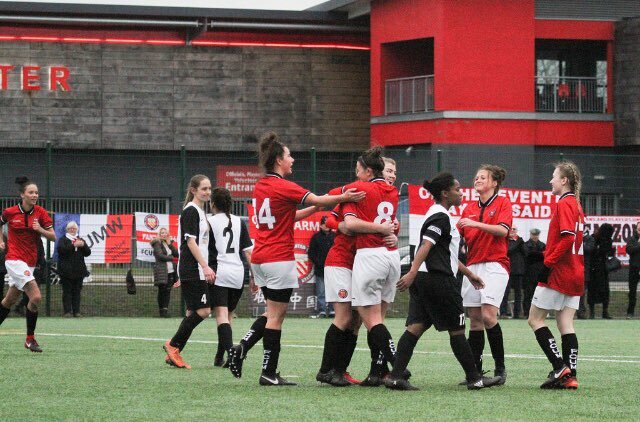 FC United defeated West Didsbury & Chorlton 3-0 with one each for Jessica Battle, Chelsea Flanagan and Abbie Carrington. They will meet the winners of the match between Stingers and Curzon Ashton in the Manchester Cup final on Friday 13th April. Corby Town were 3-0 victors at Roade on 11th February to reach the Northamptonshire Cup final and now face Northampton Town, who won 3-2 at Thrapston Town last week. The final takes place on Sunday 29th April at Cogenhoe United FC. Northumberland will see an all Newcastle United final, with the Magpies’ first team having thrashed Wallsend BC 9-0, while their Reserves knocked out Alnwick Town 3-1. Jess Foster got four and Megan McKenzie scored three in the former. Radcliffe Olympic won 6-0 at Market Warsop in the Nottinghamshire Cup – with doubles by Rania Ramadan and Beth Bailey – and now take on Nottingham Forest, who had a walkover against Arnold Town. In the Oxfordshire Cup, Headington scored first at Barton United and their goalkeeper saved a penalty but they still went down to a 3-1 defeat. Oxford City crushed home side Chinnor 19-0 in the other half of the draw, to stroll through to the 15th April final at Thame United FC. Larkhall Athletic beat Bishops Lydeard 3-0 in the Somerset Senior Cup, while Keynsham Town had a walkover against Hamilton. Aberystwyth Town stormed into the Central Wales Cup final, their 10-0 success at Penrhyncoch featuring a Naomi Evans hat-trick. Either Tregaron Turfs or Llanfair United will join them and they play on 25th February. Penybont will compete in the South Wales Cup final after sending Villa Dino Christchurch to a 6-1 defeat, Megan Bailey with three of their goals. Caerphilly Castle host Barry Town United in the other last-four tie, with the final set for Saturday 5th May.